Using Mozilla’s Open Badges and Badgr, we are issuing Botmaker Badges to people who create bots and resources for botmakers! See the list and conditions for applying below. Once you get your badge, you can add it to your Mozilla Backpack and show it off like this! 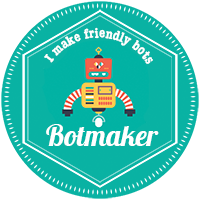 To apply, add your bot to Botwiki using our submit form, and at the end click the option Apply for Botmaker Badge. The email will not, of course, be published or used for anything other than send you your badge. If your bot is already on Botwiki, you can send us an email (or a DM on Twitter) with your email address and a link to your bot. To apply for this badge, send us an email (or a DM on Twitter) with your email address and a link to at least one tutorial that teaches how to make a bot. Please also provide a short description that includes information on the targeted audience (beginner, advanced) and language(s) and technologies used. This badge is awarded to the winner of the Monthly Bot Challenge. 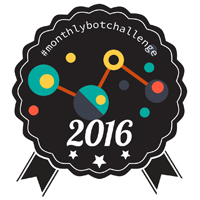 For details, see the Monthly Bot Challenge page, or browse the past winners.